Today is for everyone, whether you did the inserts yesterday or are going for a basic legging- we will all continue here. The Inspires have a triangular gusset, which I find easier to install than an oval one, but that still allows for plenty of movement. My tutorial today will walk you through the process of installing the triangular gusset, and sewing your leg pieces together (front and back). Ready? Let’s rock! 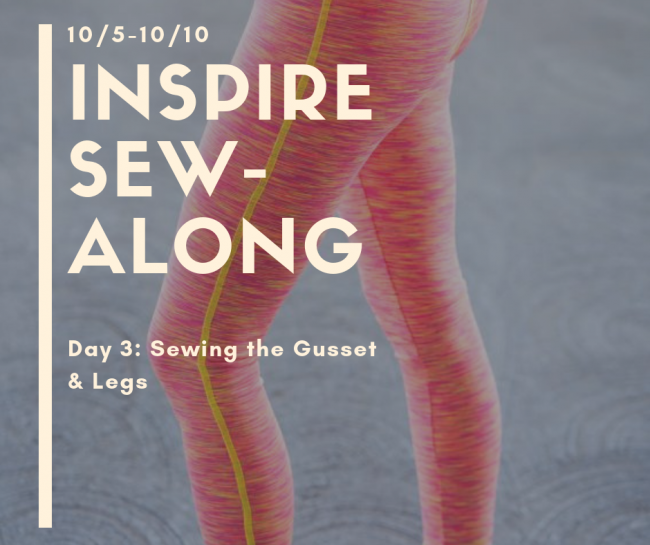 Have a leggings pattern that doesn’t come with a gusset? I wrote a blog post on the Greenstyle blog yesterday showing how to adjust your pattern to add a gusset, and you can find the triangular gusset piece for FREE here! If you already know how to construct the leggings, but just want a straight up gusset tutorial, find that video HERE. That’s it! Don’t forget to post your progress on the Greenstyle Facebook page, and drop me a comment below if you have any questions! If you’re enjoying this SewAlong, make sure you subscribe to my blog so you get first notice of any future events!